If you're wondering who can fast safely, the answer is most of us. In most cases all that is necessary is average good health, but there are exceptions. Water fasting, due to its greater intensity and total lack of electrolyte replenishment, stands alone with its unique warnings and precautions. This is why most of the dangers of fasting apply to the water fast and why any water fast of longer than 3 days should be supervised by a fasting professional. But the other fasting methods which include some, albeit sometimes small, amount of nutrition, are considered much safer for non-supervised fasts. That bit of nutrition can provide important elements to help support your body's functions. Fasts like juice and fruit and rice and Master Cleanse are all considered much milder while still providing for the detoxing and healing of the body. What is meant by "average good health"? It means having sufficient physical strength and adequate reserves to carry you through. You'd need properly functioning liver and kidneys and not be severely anemic or malnourished. Pregnant and nursing women. The effects of fasting on an unborn fetus are unknown. As far as nursing, Annemarie Colbin, author of Food and Healing, says she fasted a couple times while nursing and her babies acted as if they weren't getting enough to eat. Even though she seemed to be producing the same amount of milk, it apparently contained fewer nutrients. Children. In the U.S. it is considered ill-advised to permit children to fast, however, in Europe it is permissible if the child is obese and has chosen to fast of his/her own will and is supervised by a professional. Certain medical conditions. As stated above, you should not fast if you have liver or kidney weakness or disease, or are extremely frail, malnourished, anemic, or exhausted. You should consult a doctor and be under his/her care during fasting if you have a weakened immune system, severely high blood pressure, medication-dependent diabetes, or weak circulation causing frequent fainting. With many conditions, it is possible to fast, but the more serious the condition, the more you need professional support during a fast to avoid any problems. If you are on any prescription medications, your requirements for that medicine could vary from day to day, making it necessary you have a doctor monitor you daily. Eating disorders. Such as anorexia or bulimia. After surgery or a major illness. Time should be taken to recuperate before attempting a fast. Also, don't fast directly prior to major surgery. Anyone who is afraid of fasting. Fear does not put you in the proper frame of mind for fasting and can lead to an unpleasant experience. Strong emotions, such as fear, are known to alter the body's physiological processes. It can shut down certain bodily functions. It also is a closed emotional state. Instead, someone embarking on a fast should be relaxed and confident, and feeling open to the positive changes fasting creates. If you are at all uncertain whether you are one who can fast, consult your doctor or health care professional. 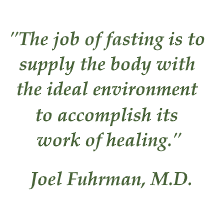 For those who want to give it a try, see Information on Fasting for general information about getting started. This article is geared toward the beginner and provides a good overview of a one-day fast. If you've determined that you shouldn't fast, based on this criteria or your own gut feeling, there IS another option! Cleansing diets can be used instead to detox and gain many, if not all, of the benefits fasting is known to produce. They often create the same detox symptoms as fasting, as they eliminate toxins and rebuild healthy tissue, but in a more gradual way. Intermittent Fasting offers several unique methods for integrating regular fasting into your life. Understanding What Fasting Is and Is Not will dispel any doubts about fasting being akin to starvation.